Are you older than 40 and wishing you didn’t need to pick up your reading glasses to see clearly? At Vance Thompson Vision, we invest every day in finding the best way for our patients to see clearly. When it comes to reading glasses vision, we use the best technology in the world to create clearer vision with a reduced dependence on reading glasses. As people age, their eyes stiffen and lose their ability to focus as efficiently, so people experience blurry near vision, called presbyopia. Reading glasses can be a temporary and burdensome solution for the blurry reading vision. With options including monovision LASIK, refractive lens exchange, and corneal inlays, patients can experience long-lasting, clear vision, both near and far. In monovision LASIK, also called blended vision, our surgeons correct one of the patient’s eyes normally, but with the non-dominant eye, we intentionally correct that eye so it is slightly nearsighted, meaning that they see clearly up close with that eye. The brain then adjusts to seeing far objects in one eye and near objects in the other eye. With monovision LASIK, the patient gives up a bit of long-distance clarity in vision for the ease of having comfortable near and far vision without needed glasses. Refractive Lens Exchange involves replacing eye’s lenses with artificial lenses before they develop cataracts in an effort to treat the patient’s dysfunctional lens syndrome. The surgeon makes a small incision in the eye’s surface using a laser, removes the old lens, and then inserts a replacement lens. With refractive lens exchange, we can offer a variety of lenses depending on what works best for the visual and lifestyle needs of our patients. The replacement lenses include various types of advanced lenses that have different levels of vision to allow patients to see clearly at near, middle, and far distances. If a patient also has developed cataracts, then the patient can choose advanced lenses with their cataract surgery. Corneal inlays are designed to heighten the patient’s depth of focus, allowing the person to see more clearly up close while not affecting the person’s ability to see far away. At Vance Thompson Vision, we offer multiple options for corneal inlays depending on the needs of the patient. Corneal inlays are placed just beneath the surface of one eye, the nondominant eye, thus enhancing the person’s near vision while maintaining clear far vision. The AcuFocus KAMRA inlay uses similar technology to the aperture of a camera. The tiny, dark ring is placed on the cornea just below the eye’s surface, and the pinhole in the center of the inlay focuses light entering the eye. By not allowing excess light rays to enter the eye, the eye is able to focus easier up close. 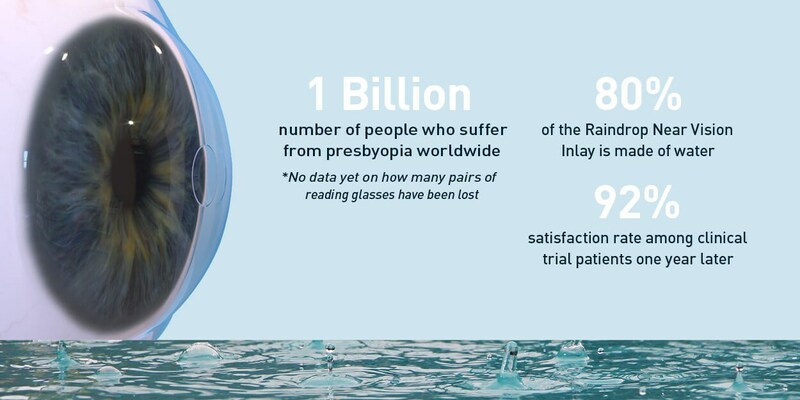 KAMRA is designed to provide long-lasting clear vision even as presbyopia develops. At Vance Thompson Vision, our doctors work each day to provide our patients who are over 40 with the best long-term solutions to their visual challenges. We are proud to be able to help our patients restore near vision and live a life less hindered by reading glasses.